I was a vegetarian for six years before I became a vegan, and before I made the change, I thought that being vegan was just more than I was able to do. I had been inspired by Diet for a New America when I first became vegetarian, and though I agreed with the ethics of veganism, I made excuses for years before I decided to give it a real try. Finally, I made a deal with myself to eat a vegan diet for a month just to see if I could do it. I stocked up on soymilk, only available in the “big city” 60 miles away, and cooked all of my meals at home because there were no vegan-friendly restaurants in my small town. At the end of the month, I had lost weight and I felt better than I had in years. Unfortunately (or perhaps fortunately, as it turns out) I decided to celebrate making it through the month by ordering a veggie pizza with cheese. My stomach revolted. Cramps, frequent dashes to the bathroom, and an embarrassing churning in my gut spoke to me in a way my month of good health had not, and I realized, finally, that my body was better off on a vegan diet. I made the change and never looked back. If Colleen Patrick-Goudreau‘s new book, The 30-Day Vegan Challenge, had been around in the early 1990’s, maybe it wouldn’t have taken me so long to give veganism a chance, and maybe I would have been equipped with enough delicious recipes that I wouldn’t have wanted to “reward” myself with that pizza. Colleen believes that many people give up on veganism because that same perception that I had–that it’s too hard–holds them back. But with the right support, information, and guidance, they’d find that changing their diet is not as difficult as they feared. 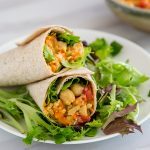 The 30-Day Vegan Challenge provides that support, answering every question a new vegan is likely to have and addressing every possible challenge, from how to eat when traveling to how to deal with social situations. 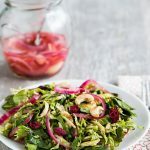 Because The 30-Day Vegan Challenge is meant to be a guidebook for future vegans, the recipes are easy and are perfect for those who are new to vegan cooking. 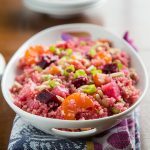 Colleen hand-picked favorites from her previous cookbooks, and they include everything from scrambled tofu (and a great primer on how to use the different types of tofu) to chocolate mousse. Most recipes do use some oil, but Colleen points out that you can reduce it by sauteing in water instead. The photographs are gorgeously shot and styled, and if you were in any doubt as to the deliciousness of vegan cooking, you will be convinced by the beauty of the photos alone. The book is divided into 30 days’ worth of subjects so that you can read each one as you go or jump ahead to to a chapter like “Celebrating the Holidays” or “Packing Lunches for School and Work” as you need it. 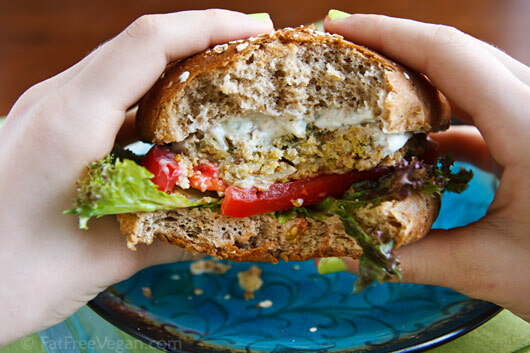 I chose to make Colleen’s Chickpea Burgers with Tahini Sauce for our weekend “Sandwich Night,” and they were a big hit. My husband and daughter enjoyed the burgers on hamburger buns while I ate mine in pita bread. They were very flavorful and the tahini sauce gave them a great tang. If you’re gluten-free, try replacing the bread crumbs with gluten-free crumbs, oatmeal, or quinoa flakes. from The 30-Day Vegan Challenge. Colleen writes: Inspired by falafel, my version is much healthier since it forgoes the deep-frying typical of this Middle Eastern staple. Pulse the chickpeas in a food processor until thick and pasty. (You may mash them by hand, but it is a little more labor- intensive and time- consuming.) Transfer to a medium- size bowl. To the bowl, add the onion, garlic, parsley, tahini, cumin, coriander, salt, black pepper, cayenne pepper, lemon juice, and baking powder. Slowly add the bread crumbs until the mixture holds together. Add more bread crumbs, as needed. Shape into patties. Place on a nonstick cookie sheet and bake for 10–12 minutes, or until golden brown on the bottom. Using a spatula, flip each patty over, and cook for 10–12 minutes more until the other side is golden brown. Remove from the oven. Alternatively, you may fry the patties with a little oil in a pan on the stovetop. While the burgers are cooking, make the tahini sauce, below. Susan's note: If your chickpeas seem too dry to form a paste, try adding water by the tablespoon until they become more "sticky." If your burgers still don't hold together, try pulsing the mixture a few times in the food processor. Nutritional info is for one burger only, no bun or sauce. Each counts as 2 points on Weight Watchers Freestyle program. Copyright © Colleen Patrick-Goudreau, The 30-Day Vegan Challenge, Ballantine Books, 2011. Reproduced by permission. In a small bowl combine the yogurt, tahini, cucumber, lemon juice, parsley, salt, and pepper to taste. 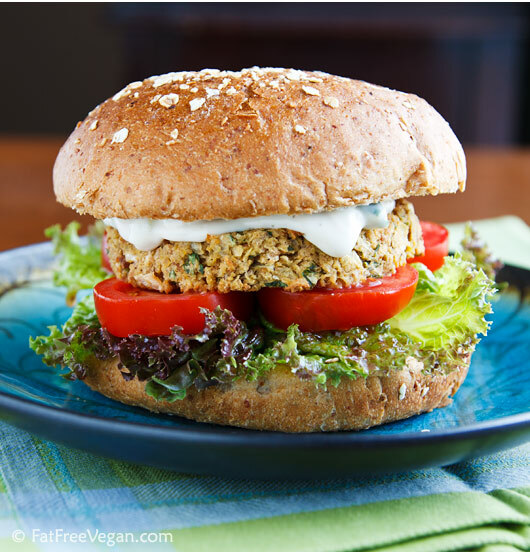 Chill for at least 30 minutes, and serve with the chickpea burgers, along with lettuce, tomato, and onion on a bun or in a pita pocket. It’s been fun reviewing vegan books for the past three weeks, but I’m ready to get back to creating my own recipes. I’ll be back soon with a new one! Hi Susan..Just curious if there is anything I could use to substitute for the tahini aside from a different nut butter? I don’t eat nuts or seeds but I’d love to try out these burgers if possible without that addition. Thanks! You can just leave it out of the burgers, but I’m afraid I can’t thing of any substitute in the sauce. 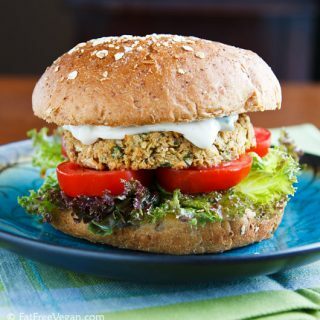 This is a great recipe and I like that the burgers are baked and not fried. These sound great, but we are trying to avoid all oil due to my husband’s high cholesterol. 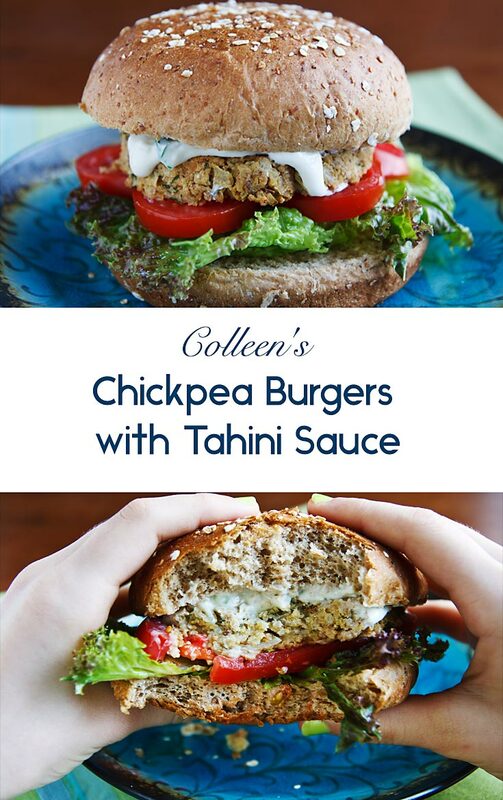 Any suggestions for leaving the tahini out of the burgers and sauce? You can just leave it out of the burgers. 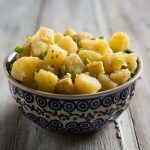 For the sauce, you could probably change it to a chipotle sauce by leaving out the tahini and using chopped chipotle pepper or chipotle powder to taste. Or just use your favorite fat-free dressing. if you’re on the fence about being vegan, definitely do the 30 day challenge and watch forks over knives. definitely opens your eyes. i went to a plant based diet after watching it and so far so good!!! I think that would be fine, Nicole. Hope you enjoy them! Oh my these are Uh-MAZING!!!! Our meat lover friends even loved them at our 4th of July meatless BBQ!! This will be a regular staple in our meals! Thank you for such an amazing recipe!! I’m not vegan (although i always like to imagine i could be).. i’m not even really a vegetarian since i sometimes eat meat on the weekends.. but what i always try to be is a healthy and informed eater. I just made these and they’re awesome. I had it in a homemade pita with some baby spinach and homemade made tzatziki. I only used half a cup of bread crumbs, left out the coriander since i don’t have any, substituted fresh parsley for dry basil (all i had) and was only able to shape seven 2-2.5 inch diameter patties. Still very good. So much flavor. Mine came out really mushy but i think i added too much water to shape. Oh well. Now i have lunch/dinner for a few days. THANK YOU! Looks fabulous but what about the bun! That looks so wholesome and yummy. What kind of bun is that? Sorry–it’s just a whole-grain roll that I bought from a store. I wish I had a recipe for it that I could give you. I just made a batch of these — OMG. They are awesome! But I have 8 left….is it okay to freeze these, or should I just keep them in the fridge and try to eat one a day over the next week?? Will they keep that long in the fridge? (I’d prefer to freeze them, if possible.) Also – FYI – I didn’t have any soy yogurt to make the tahini sauce, so instead, I mixed into a small bowl about a teaspoon of tahini, 2-3 tablespoons of your prepared Hidden Cashew Ranch Dressing, and a little bit of lemon juice. Was fantastic! I’m so glad you liked them! I don’t think you’ll have any trouble freezing them, but I also think they should keep for a week. Just tried this recipe out tonight and it was super yummy! I ended up mixing all the chopped ingredients, chick peas, and seasoning (minus the breadcrumbs) up in my Vitamix and it actually turned out quite well. It was a good thing I pre-chopped the parsley and onion, because as I expected, the mixture was too thick for the blades to actually turn much of it over though it did manage to break up the chickpeas into a good consistency. It actually came out quite a bit like hummus, but a little bit chunkier. I ended up not adding any of the breadcrumbs at all. I also used plain coconut milk yogurt in place of soy yogurt in the sauce, and it came out fine. I served it like falafel in a pita with cucumbers, tomato and onion. I’ll definitely be doing it again. I, living in the rural area I do, haven’t had falafel in a few years (can’t believe it’s been that long. When I lived in the city, they were a staple). Sub’d natural peanut butter for the tahini and quick oats for the bread crumbs and they turned out just fine. Just wondering why non vegan ingredients like yogurt (Animal product) are on a vegan recipe site? Soy yogurt is not an animal product. I am new to vegan diet. Thank you for these recipes. I will try some this week. Hope this would inspire to continue. Welcome to the vegan way of eating! I hope you love the recipes. I love your food, but this recipe just will not behave for me!! I followed every step except for the salt, and the patties seemed to be forming better this time, so I didn’t add any water. After 10 minutes in the oven, they fell apart! So that was frustrating. I’m sure they will taste good, but it’s not really a burger if it can’t hold its shape. I just tried these, and i must say , they were beyond delicous…… i did make a few alterations,… nothing major… i boiled my canned(already cooked ) chickpeas for a good 15 minutes so i could get the skins off(do this when making hummus too) the skins float to the top and u skim them out with a slotted spoon(discard in trash..or eat..)…I used garlic powder instead of fresh(i actually had the clove skinned and forgot to put it in haha)…. and i may have added a bit extra salt and cumin… also for my topping i omitted the sour cream and just used lemon juice and tahini ( i was tempted to chuck in some minced onion or a dash of cumin, but didnt)…oh also i finely chopped and added sugarsnap peas into the mix.. and i didnt have pitas so i used tortilla wraps(was gonna use bread.. but i think the wrap would be much better…).topped mine with the sauce i made(which i love, it was kinda runny about 3 tsp lemon juice , one tbsp of tahinni..was tangy..) and some finely chopped onion , slices of tomato and lettuce… SO SO SO dang good!! And i fried mine in about a tsp of olive oil and a bit of Pam type spray.. 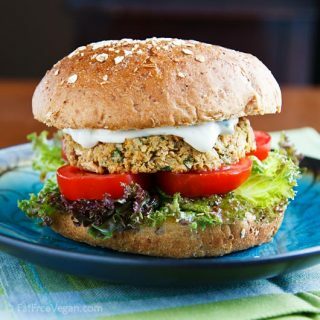 I have to say.. i dont know if i will be buying veggie burgers again ,when i can make these and hopefully freeze them too.. i froze one tonite (leftover) hope it freezes okay.. .. ty very much. !! making them again.. have a few fans of them already i would love to be on your mailign list !! !i joined the fb page too !! pls share more recipes like this !!! These hit the spot today. Just right, perfect. I’ve made them before but this time, something just seemed magical about them (maybe the flavor and fat in the tahini was what I needed). WOW! These things are HUGE! I measured 1 1/2 cups of the chickpeas and after it was all mixed together, I realized I could have made 3. Instead I made two huge ones and skipped the side dish….also melted some Daiya Cheddar “cheese” on top. So excellent! Thanks so much for a fantastic recipe! I’m new to veganism and I’m always on the lookout to try something new. This one is a winner! You made 2 burgers out of the whole recipe? They must have been enormous! I’m surprised they cooked all the way through. The recipe is supposed to make 8! I’ve made these time and again, and next time–this idea just occurred to me–I’ll try making them into falafel balls instead of the burgers. Could I use a blender in place of a food processer? A blender would have a hard time blending chickpeas without any liquid. It would be easier to mash them with a potato masher. So, I made these w/the tahini sauce. (I’m the only vegan in the family, but when I cook they eat what I make (my rule!)) I also made the “best vegan green bean casserole” as a side dish. Well, my youngest who hates vegetables (especially mushrooms) asked for 3 helpings of the green beans (eating the mushrooms, too), and the two older teenagers put the beans on top of the burgers, and then topped that with the tahini sauce. So, these two recipes were a big hit with the non-vegan family! Thank you, Susan!! I actually made extra and have put them in the freezer (uncooked.) I’m anxious to find out how they turn out when I cook them at a later date.